Leave it to a band like KORN to continue to reinvent itself two decades and ten albums deep into its career. 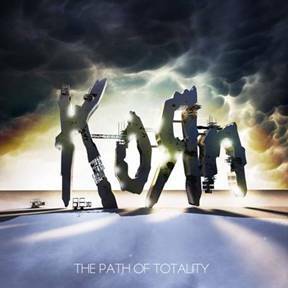 THE PATH OF TOTALITY—due out December 6 on Roadrunner Records–is an experimental album which finds KORN shifting gears and exploring new territory with some of the most important emerging producers on the electronic music scene today. For The Path of Totality and its corresponding “P.O.T.” ballroom tour this November, the band will change course again by collaborating with the likes of leading U.S., U.K. and Dutch dubstep trailblazers Skrillex, Feed Me, Excision, Datsik, Noisia, Kill the Noise and 12th Planet on record as well as on stage. Expect something completely new, yet utterly and definitively KORN. The band’s first offering from the album “Get Up!” with Skrillex was the surprise Top 10 rock hit of the summer, the buzz of which started in April in Coachella‘s Sahara tent when Jonathan and Munky joinedSkrillex on stage for a show-stealing unannounced performance of the song. Check out the track at: http://tinyurl.com/3q3rmqa Now KORN has unleashed “Narcissistic Cannibal,” another creation withSkrillex and Kill the Noise at www.korn.com. Look for KORN to kick off the first leg of their “Path of Totality (P.O.T. )” tour on November 3 at the House of Blues in Boston. The band will perform material from the new album as well as tracks from their extensive catalog. On each date, they will be supported by dubstep DJ’s Datsik and Downlink, as well as a live set by young upstart Dutch Dub-rockers Dope D.O.D. for an unforgettable one-of-a-kind musical experience unlike any other KORN tour. Royksopp Drop New Digital Single, "Forsaken Cowboy + Keyboard Milk"